This article refers to the "Dozer" in GTA San Andreas. For a similarly named "Bulldozer" in GTA Vice City Stories and GTA Chinatown Wars, see Bulldozer. A Dozer in GTA San Andreas. 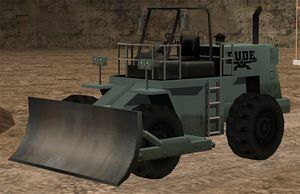 The Dozer is a heavy earth-moving vehicle in Grand Theft Auto: San Andreas and Grand Theft Auto V.
The Dozer in GTA San Andreas is designed as a four-wheel bulldozer (hence the name), being stamped with a DUDE logo in association with the manufacturer of heavy machinery. Obviously, the vehicle is devoid of any luxuries, it's roll cage design is similar to the Forklift's cage and is depicted with an open driver compartment with no doors, leaving the player vulnerable to being pull out of the vehicle by hostile NPCs; the Dozer is also equipped with an adjustable ram. Entering the Dozer will execute a unique animation of climbing into the vehicle. The Dozer can only seat one person. It is mainly used for the Quarry side-mission. For GTA San Andreas, the Dozer is very large and heavy, and therefore has a slow top speed; the Dozer also features rear wheel steering, meaning that it is pushed into turns instead of pulled, making for a very small turning radius, although this also makes the Dozer more vulnerable to tailspins if in higher speeds. Its movable ram can be used to plowed through a bunch of other cars is no problem for this vehicle; as its weight and torque make it nearly unstoppable. Because of its bottom-heavy design, the Dozer is designed to rest upright after a flip. This feature is very useful in Hunter Quarry's Quarry missions, as players can drive and flip the vehicle down several tiers of the quarry without the risk of having the vehicle resting on its top or side. Bulldozer, GTA Vice City Stories and GTA Chinatown Wars equivalents. This page was last modified on 22 December 2013, at 01:10.